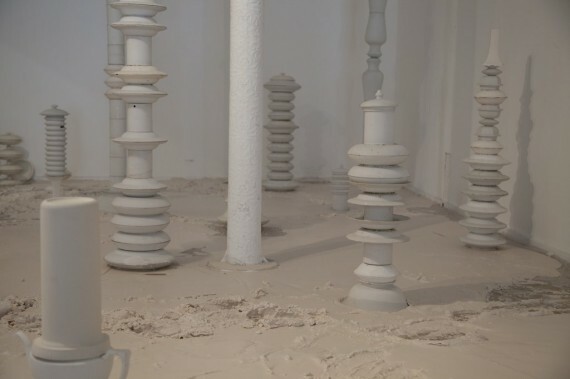 The third British Ceramics Biennial in Stoke on Trent highlights both the importance of artistic creativity to the industry and the appeal of ceramics to the fine artist. We report from the Potteries, once the world's centre of china production and now struggling to find its place in a global market. Traditional wisdom has it that whenever you break a piece of china, there is an outbreak of cheering in the Staffordshire Potteries. Why? Because you will have to go out and buy a replacement, thus keeping the area’s workers busy. But since the 1980s, the UK’s traditional capital of earthenware production has been in decline, with labour outsourced to the Far East, local unemployment high, and factories closed. Partly held in one of those abandoned factories – formerly that of Spode, until its closure in 2008 – the third British Ceramics Biennial aims to show that the industry may have diminished, but it is far from dead. There’s no denying the ambition of the Biennial, which highlights not just the importance of artistic creativity to the industry but also the appeal of ceramics to the fine artist. At Stoke’s AirSpace Gallery, Corinne Felgate’s new show, Totem: Trajectories in Tragedy & Triumph, addresses the historical importance of the industry and its meaning to local people. There is both fragility and strength in Felgate’s constructions. When asked about the risk of visitors knocking over one of the crowd of totemic stacks, Felgate smiles and says that there are no worries regarding health and safety. Across the road, at the Potteries Museum & Art Gallery, the AWARD section of the Biennial highlights work by 22 artists representing the best in UK ceramic work today. The artists were selected from 170 applications by a panel of professionals including 2011’s overall winner, Phoebe Cummings. “We’ve probably got more figurative objects this year,” says the Biennial’s Co-Director, Jeremy Theophilus, mentioning Christie Brown, whose installation The Uncanny Playroom is enticingly eerie. Another, Skifting, by Malene Hartmann Rasmusson, is amusing and disturbing. Its title refers to Changelings, mythological creatures left by fairies in place of human children, and features a strange, angular-shaped, green-glazed ceramic ‘creature’ in a cot, and a cacophony of lullabies that play when you pull a choice of cords. One intriguing ingredient in the AWARD show is the inclusion of works made with new technology. Jonathan Keep, for instance, offers a selection of irregularly-shaped pots made on a 3D printer, using slip or liquid clay. Are mainstream manufacturers worried about the impact of 3D printing, I wonder? China looms large, in more ways than one. The first thing visitors to the Spode site’s China Hall notice is Clare Twomey’s installation, Made In China, consisting of 80 tall, red vases, made in the city of Jingdezhen, where 79 of them were also decorated generically. The one remaining vase – which visitors can have fun trying to find – was gilded in 18 carat gold at Royal Crown Derby, which the Biennial’s other Co-Director, Barney Hare Duke, reminds me was recently bought out by Steelite International, one of Stoke’s leading manufacturers of catering tableware. “The total value of the 79 vases and the cost of the transportation is a fraction of the single piece that’s been painted at Royal Crown Derby,” he says. The Spode site is truly vast, at times resembling a small town, with its own street names. Visitors can explore the far reaches of the factory via Bergen Academy of Art & Design’s site-specific research project, Topographies of the Obsolete: Vociferous Void, featuring 40 artist interventions. Furthermore, the introduction of pavilions to the Spode site provides showpieces for four Artist Into Industry residences: Corrine Felgate with Steelite, Simeon Featherstone with Johnson Tiles, Peter Jones with Ceram, and Lawrence Epps with Ibstock Bricks. Epps has made a mass of little hollow bricks from extruded clay, each containing a deskbound office worker. A light-hearted comment on modern corporate work practice, every visitor can pick one up and take it home: a topical souvenir from a topical Biennial.